Reproductive Partners Medical Group - Reproductive Partners Medical Group, Inc. Reproductive Partners Medical Group, Inc., is a group of leading Southern California fertility doctors, internationally and nationally recognized for our success in IVF - in vitro fertilitization, egg freezing and other fertility treatments for women and men. Title: Southern California Fertility Clinic - IVF Specialists - Reproductive Partners Medical Group, Inc. Description: Reproductive Partners is group of leading Southern California fertility clinic in Beverly Hills, Redondo Beach, Orange County and La Jolla creating fertility success stories. 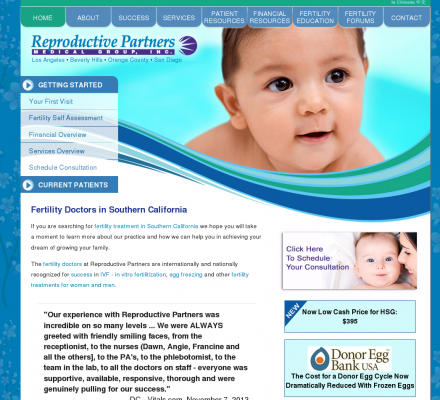 Fertility Physicians of Northern California (Popularity: ): Evaluation and treatment of infertility. Located in Palo Alto.